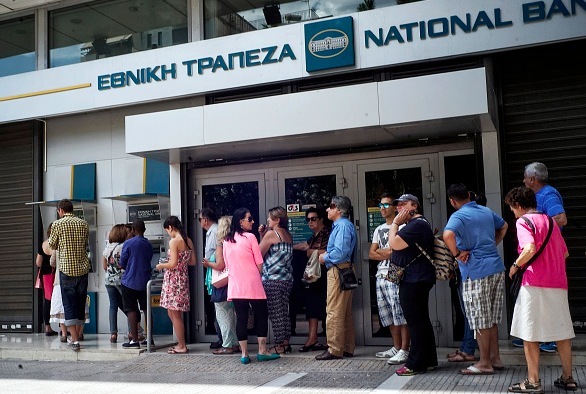 Is Wall Street Responsible for Greece’s Financial Collapse? Was the US government’s Wall Street bailout wrong? Is president Obama to be blamed for it? Do we really need government and taxpayers’ involvement in the financial sector, education, or health care? These were questions in 2008, when nearly 14 million manufacturing jobs were lost in the USA, foreclosures reached record highs with nearly 1 in every 6 homeowners loosing their homes, unemployment was 12% (now is 5%) , the Dow Jones Industrial Average on March 2009 was down to 6,626 (now is 17,700) and the US Budget Deficit was $1.5 Trillion (now is $378 Billion). The US’s Quantitative Easing policies following the bankruptcy of Lehman Brothers, has contributed to the US’s reduction of systemic risks, to increased productivity and consumers’ confidence, and has helped improve the USA’s as well as the world’s economic growth. The US Government had the ability to take action quickly, using the leverage of the mighty dollar, printing money and pushing for spending (by Congress, approving the TARP and ARRA acts). Greece on the other hand was on a path to a major catastrophe. Germany had a different plan for Greece and Goldman Sachs helped by manipulating the Greek economy’s financial data to entrap the Greek government’s ability to borough more money. (http://www.spiegel.de/international/europe/greek-debt-crisis-how-goldman-sachs-helped-greece-to-mask-its-true-debt-a-676634.html). The results of Europe’s industrious North, led by Germany, are the EU’s policies of austerity, deregulation, privatization and gutting labor and social programs that so far have produced negative growth and have resulted in lowering Greece’s Annual GDP by as much as 20%. The Greek debt ratio in the mid time has risen to 180% of Greece’s GDP and now stands at $380 billion. This debt ratio is not sustainable nor serviceable for a small economy like Greece’s. Many parallels can be drawn here! Going back to USA’s for instance, on the subject of deregulation and privatization, i.e. health care industry – did it made health insurance coverage more affordable? Since his election to the presidency in 1980, Ronald Reagan has sought to reverse the trend toward government involvement in health care – Joseph Julian, William Kornblum 1986, 557 pages – “Health Care For Profit”. But guess what? We went from 100% health coverage to a declining percentage, year after year, until ObamaCare came into effect to address the uninsured with new government regulations. The nation’s health care cost today however, still is one fifth of our Gross Domestic Product and the cost is rising on average 3 to 5% above the annual inflation rate. Anyone out there remembers the Enron stocks? If you read the chronology of events below, perhaps you may notice the pieces of legislation relating to The Commodity Futures Modernization Act of 2000. The Commodity Futures Modernization Act of 2000 or CFMA (H.R. 5660 and S.3283) repealed the Shad-Johnson jurisdictional accord, which had banned single stock futures in 1982. The legislation also provided certainty that products offered by banking institutions would not be regulated as futures contracts. This Act was largely the cause of the famous energy prices gouging that finally led to the Recall elections in California and Governor Gray Davis’ removal from office. The people in California paid over $60 billion on inflated energy bills to oil Tycoons from Texas who sought more wealth under the guise of free market economy. Many believe that legislation written primarily by Gramm in 1999 is in large part to blame for leading to the 2008 mortgage crisis. The Gramm-Leach-Bliley Act is perhaps most famous for repealing the Glass-Steagall Act which regulated the financial services industry. The legislation allowed Swiss Bank UBS to purchase several American institutions. Gramm later became a lobbyist for UBS, collecting over 750,000 USD in fees. UBS alone issues over 18 Billion USD in sub-prime mortgages. Referencing “God”, “family values” and “Free Market” as core principles of this ideology, has been an obstruction and diversion from the real issues and the American people know that! Millions of Americans lost their jobs, their homes, their health care coverage, and millions more are struggling to make ends meet. Yet some Americans are supporting this extreme ideology. This trend continues at a global scale and profits are so immense that nothing can stop it. The oil companies made hundreds of billions in profits in the so called free market economy while millions of US citizens lost literally everything. What happened in US is now happening in Greece, Portugal, Spain, Italy, and so on! The American as well as the world’s financial system is facing unprecedented challenges. The Economies around the world would always be at risk. Is there a need for some new resolve and political direction? The financiers, bankers, fund managers and those in the derivatives and credit default markets would be the prime beneficiaries at the expense of rising and desperate populations around the world. For me and I believe for most people, this means that our financial situation is terrible and big changes are necessary. The reason why we came to this point is just so difficult for ordinary folks to comprehend. They involve Derivatives, Credit Defaults Swaps, Hedge Funds and all sorts of complicated trades that are unlike Stocks and Bonds. How did we come to this mess? Why this part of the world’s financial system is called Shadow Financial System? Shadow, has a conspiracy connotation, doesn’t it? Most people know about stocks and bonds. They can open their newspaper and check the latest value of stocks and bonds, or get on to the Internet and find out where the price value of certain stock is. It is a transparent market and the information is easily available to most people, but since 1980 a much more powerful system has been developed by the banks. It is called the Complex Derivatives market. Believe it or not, there is more money invested in these Derivatives than stocks and bonds. These Derivatives are essentially bets that certain events will take place in the future. Most popular is the interest rate, betting on whether the Feds will reduce or increase the rates and by how much. These are private transactions. You cannot open the newspaper and easily find out what’s going on. That’s why they are called Shadow Market or Dark Market. Unlike stocks and bonds, there are no regulations for the Shadow Market. No regulations? How did this happen? In December 2000 right before Christmas a bill was passed by the Congress called Commodity Futures Modernization Act (CFMA). I assure you that the drafters of the bill were not the members of Congress. Who were they? Bankers and lawyers found enough fools in the US congress to do it for them. They convince Senator Phil Gramm to introduce this bill and free the system from any regulations. We’ve been embarking on this financial fiasco ever since. By the way, Phil Gramm was the chief financial adviser for Senator McCain. What are these Complex Credit Derivatives/Credit Default Swaps? Here is a simple analogy. It is like this, say if you want to invest in a basketball team, the Stock Market way of doing this would be to invest in the team, but the Derivative way of doing this would be by just betting who will win or who will lose! One of the bets we have now is whether or not homeowners will pay their sub-prime mortgages. In other words, instead of owning the team, you go find a gambling operation and bet whether the team will win or lose! For the most part the banks thought those mortgages would be paid off because they thought they are risk less-investments. So when you heard that banks are losing money, it basically means that those bets went bad. The other thing the banks did was that they added these bets to their books as assets. But these assets as they thought are now liabilities. Now, there was some financial prudence to this. For instance in regards to sub-prime loans, the investors wanted some kind of insurance to protect themselves against losses. So the banks told investors: No problem, we will insure these investments. They went to the insurance companies and asked them to insure the loans. On the documents the banks did not want to use the word insurance. Because once they used the word insurance, State Insurance Commission would get involve and they wouldn’t like any regulation by the State Insurance Commission. So, what the banks did was instead of using the word insurance they used the phrase Credit Default Swap. The insurance companies thought these are risk free transactions. So, they gave out billions and billions of dollars worth of insurance faster than they could write it. We have been hearing about these insurance companies that are beginning to fail. You probably heard about Bear Stearns and AIG bailout by the Feds. The question is – Is Bern Sterns and AIG the end or is it the beginning. If it is the beginning, we are going back to 1920’s. Time will tell. Bear Stearns was essentially bankrupt and an emergency plan had been hatched by the Federal Reserve Bank and JP Morgan to bail the company out. This news is a shocker. Bear Stearns is the fifth biggest bank on Wall Street. If it was in trouble, then every single financial institution has to be questioned as well. A look into the Bear Stearns deal reveals the true troubles on Wall Street. First and foremost, the company was in a lot worse shape then anyone expected. Although it was trading at $30 a share, the bailout by JP Morgan was at $2 a share. Even then, the Federal Reserve Bank had to agree to take all the risk of the securities carried by Bear before JP Morgan would bite. In short, Bear Stearns is a total loss by all reasonable assessment. There is another troubling sign regarding this situation. The deal is not being propelled by JP Morgan. It is the Fed that is providing the impetus. Because of certain lending laws, the Fed cannot directly assist Bear Stearns. Instead, it is using JP Morgan as a go between. The indirect effect, however, is the same. The Federal Reserve Bank is trying to save a large investment bank. The last time that happened was during the Great Depression. Think about that for a minute. The other more important question is – Should we have an economy based on people making good or bad bets or should we have an economy where people do inventions, open new companies, build factories, manufacture and sell products and advance the American society to reach out for the American Dream. Today, the make up of our economy is based on people sitting at their computers and making bets all day long. The Government found a way to cut all regulations and to reward these people, while the rest of the world is building real businesses and manufacturing plants. We lost our competitive edge; the corporate CEO’s only in the USA are still making huge salaries while our products continue to fall short on sales abroad. Our factories are shutting down and we are amassing record budget deficits. Unfortunately, we are making heroes those shrewd speculators and gamblers while our government is doing nothing? First collapse was in 2008 in the US, now is Greece! Bailout works like a foreclosure, except that in Greece the people would suffer much and would have no sovereignty for years to come!